The sanctuary of Athena Pronaia is the first that would met the ancient visitor, as the present one, as he comes via land to the Delphi. This fact gave also the name to the temple as pronaia means that her temple is found before the temple of Apollo in the main sanctuary. And this sanctuary is surrounded by surrounding wall of the classic years in which the sacred buildings are enclosed as well as a part of a smaller archaic wall which is a rare example polygonal wall building. The surrounding wall has here openings for access from all the sides. And here the evidence of worship is related to the last Mycenaean period due to female figurines that were found under the archaic temple and the altars. Entering the temple we see on the left about two small archaic buildings that consider to be treasures. Right to us exists a total of altars that most belongs in 6th cent B.C. The large one belongs to the temple of Athena while the smallest, according to the inscriptions found, are of Zeus, Athena, the Eileithyias and Ygeias (Health). The first large building of the sanctuary is an archaic temple of Athena. The one that we see in front of us built at the end of 6th c.B.C. was Dorian peripteral with 6 x 12 columns and had embossed metopes and relief sculptures of which where saved only little pieces. It is interesting that in its foundations found built column parts that belonged to an older temple, of middle 7th cent. which is one of the older monumental temples of ancient Greek architecture. The temple that we see should also have been destroyed in the big earthquake of 373 B.C. when it begun to built the new temple of Athena in the western side of the sanctuary. After the archaic temple, we see the ruins of two small buildings which are considered to be treasures. The first is dorian dated in the beginnings of 5th cent B.C. and the second is perhaps Massaliote's tribute, ionic, was built around in 530, and was a thin building with a lot of embossed jewels. 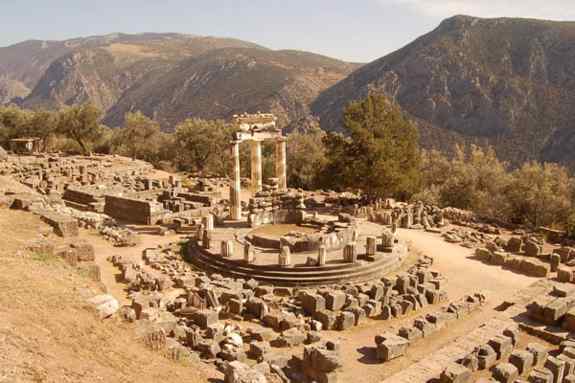 And now we are faced with the 3 erected columns of the famous Delphi tholos. It is circular building of diameter 13,50m. which is dated in the beginning of 4th cent. B.C. It had stone foundations and marble at the upper case part of the building. On a three level crepidoma (base) was standing a circular cella which was externally surrounded by 20 dorian columns. In the interior 10 engaged corinthian columns among the earliest examples of this type, were resting lightly to the walls. Between the external columns and the walls of the cella existed narrow path with delicate decorative roof. Above the outer colonnade rested epistyle with frieze of triglyphs and metopes with relief representations from the fight of Greeks with the Amazons (today in the museum). The use of tholos, as all the circular buildings in Greek sactuaries, remains still dark even it is supposed that is related with chthonian cults. Westwards tholos we see the foundations of a newer temple of Athina that was built around 370 B.C. It was Dorian also but no peripteral, and had 6 columns only in the facade. In the depth of cella a pedestal for statues that were placed in the roman age for the adoration of Roman emperors. This temple partially stands on the neighboring building the use of which has not yet been declared cleared - is considered either house of priests or restaurant.